Open Edition Images have a large white area surrounding the print on all sides. This extra area is not counted in the print size. The Image Title and Johns Signature is inside the print area in the lower left and lower right corners respectively. Limited Edition Images have 15mm of black printed along the top and sides and 20mm of black along the bottom of the print. There is extra white - non printed around the image for handling. Neither the black or white is counted as part of the image size. For Limited Editions only the Image Title and Johns Signature is outside the print area in the lower left and lower right corners of the black respectively. By opening the print with your framer – in his workshop - you both see that the print is free of any marks or defects at the time you leave it with the framer. Images less than 30 inches wide ( 762mm) have smaller moulding profiles - this is not always apparent when looking at the previews on the web pages. Typically the smaller mouldings are 30mm to 40mm wide and the larger 30inch series and above use a moulding that is better balanced and vary from 45mm to 60mm in width. When selecting different mouldings on the preview page ( when available) the moulding displayed will not be accurate although selecting between small and large images the moulding variation will be apparent. Black Spacer between Mat and Print creating a 3D effect. Signature is on black border. 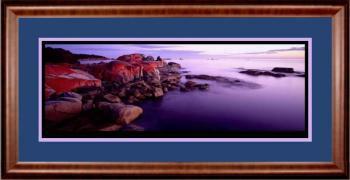 Items marked NA - Framed imaged 40 inch and above are oversizes and will not be carried by Australia Post. Contact the Gallery for a quotation and an alternate shipping method. A frame should compliment the artwork and never dominate. There are hundreds of different moulding from many different manufacturers and when combined with various mat colour combinations the choice can be daunting. A basic rule is to keep it simple. Have a look at how we have framed our images. The reason that we have a relatively small choice of moulding and mats in the gallery is that these all work very well with most of our images. Choose a frame that fits your surroundings. But do keep in mind that you may wish to relocate the image to another location, or another home or redecorate in the future. Again that is why we have chosen the combinations that we have and they are designed to compliment the images and will fit into most office or home situations. For commercial applications where we are asked to supply a selection of images we do offer a custom framing choice and generally we suggest that all images are farmed the same way for and office or corporate situation. Please contact John if you are interested in decorating you office or building with Johns Panoramic Images. coordinates with your room or as in the case of our standard walnut profile something that blends well in most situations. If you have wooden accents in the room, you may want to pick a frame that matches. 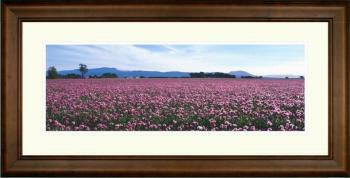 Large images generally require a wooden frame to look balanced as they are available in wider styles. Non reflective glass is is not usually needed except in adverse lighting conditions. Usually placing lights at suitable angles to the viewer will produce the desired result. All our prints are printed on Epson Inkjet printers using Pigment Archival Inks. The Paper we use in combination with the Inks and the framing techniques we employ should allow the print to last many years. Some estimates are as much as 180 years. Our prints will last. If you visit our gallery you will see that we have a number of images outside in full sunlight everyday - we rarely sell those one but they do not fade - they are there to showcase Johns images of course but also to illustrate their lasting qualities. Smaller prints are dry mounted onto acid free foam core whilst larger images are mounted to MDF board. The MDF is pre coated with an adhesive acid free dry mount film which acts as a seal between the print and the MDF. Acid free mats are used and long life acrylic instead of glass. Using acrylic means that we can ship framed images without risk of breakage - breakage that can damage the print surface. For MDF mounted images everything is then bound with acid free tapes at the edges to act as a primary dust and vapour barrier. before assembling into the frame.